This is the last post of this event. 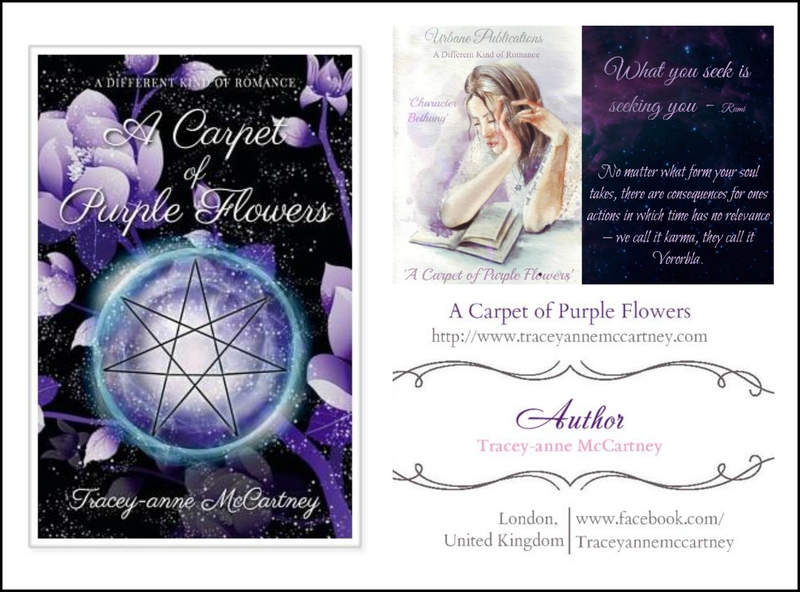 Tracey-anne McCartney has recently had her debut novel, ‘A Carpet of Purple Flowers’ published. Merry meet at the time of year when the veil between this world and the next is at its thinnest. The old year has passed and sunset on Samhain marks the beginning of the Celtic New Year. So what better time to introduce my very own new beginning ~ A Carpet of Purple Flowers. I believe that a certain magic is carried from our soul through to our creations – be it a piece of art, dance, poetry or form of storytelling, etc. With this belief in mind, I hope that I can spread a little magic your way. My mind raced as folklore came entwined with love, fate entwined with choice, science with spiritual teachings – all guiding me to write a romance that revolves around a karmic cycle. Magic is many things, but for me, it stems from love, that unseen force elusive to science, baffling all logic. Learning to love yourself can be one of the most difficult lessons, but eventually, we can learn to let go of the things that no longer give our life purpose, though it can take time. Often, we go through life in automatic mode, sticking with what we know or feel comfortable with. The main book character Bea, discovers that strength comes from an inner light which secretly masks eternity. Let me share with you a secret place, in which only a parted veil exposes. Briefly visit an ethereal plane in which Otherworldly, angelic-type beings, tend to a well of souls. It is there, in Calageata that the purple flower of Vororbla (karma) grows, emitting a thick mist, ready to greet the essence of a soul. When did you begin writing? Have you always envisaged being a writer? Tell us about the novel, title, and what inspired you to write? The novel revolves around the life of a young woman named, Bea. She works in a secondhand bookshop in SW London. One evening, her normal quiet life turns upside down as she slowly starts to unravel a secret past after an encounter with two sects of an Otherworldly race. She soon discovers not everything is what it seems. A Carpet of Purple Flowers is a story of love and growth. Once you read through the book the relevance of the title becomes clear. There is a certain scene that captures it’s importance beautifully. I used ‘Purple’ in all of the trilogy titles as it relates to the flower of Vororbla – a soul flower. This connects all souls in an ethereal home called, Calageata. Purple is the colour most often associated with royalty, magic, and mystery, it is also the most powerful wavelength of the rainbow. What POV do you use? What theme is strongest in your book? Romance essentially, a karmic cycle of love. Elements of folklore mingled with my own imaginings. I’ve tried to create a story that feels real, incorporating places that actually exist. Such as, Coldfall Woods, and Inchmahome Priory in Scotland. More information can be found on the book website. What would you like readers to come away with from your novel? Ideally, the message that no matter what happens in this crazy life, to always keep your inner light bright and to believe in yourself. We all have ups and downs and when you’re at your lowest ebb, to remember that the magic begins within. ‘Keep your light bright’ – Is a phrase used throughout the story. The Otherworldly use the word ‘Ameusouya’ (Am-e-us-ou-ya) meaning complete/whole (you, me, us =one). All are inspired by the word, Namaste. The crystal cave – Mary Stewart, The Mists of Avalon by Marion Zimmer Bradley, There are too many to mention here, pop over to Goodreads to see some of the books I’ve listed – ongoing. I read a lot of non-fiction, I have a thirst for knowledge, especially of anything that involves folklore/art. Possibly one of my favourites is ‘The mists of Avalon’. I really resonate with this type of theme – the goddess, ancient wisdom, etc. Devoured ‘The Game of Thrones’, and at present I’m on the fourth book of the ‘Outlander’ series by Diana Gabaldon. I also really enjoy Dan Brown’s style of writing, his play of fact and fiction – very clever. He excites the mind, daring you to apply your own research, to see things a different way. His books have interested many readers that wouldn’t have normally read that genre/topic. Oh, let’s not forget WB Yeats, CS Lewis, Conan Doyle, Fiona Macleod / William Sharp, and many, many others. Do you see yourself as a one genre author, or are there other elements in your writing that you can see yourself developing in the future? Hmm, I see my story as being quite diverse, and hopefully, my writing reflects this too. 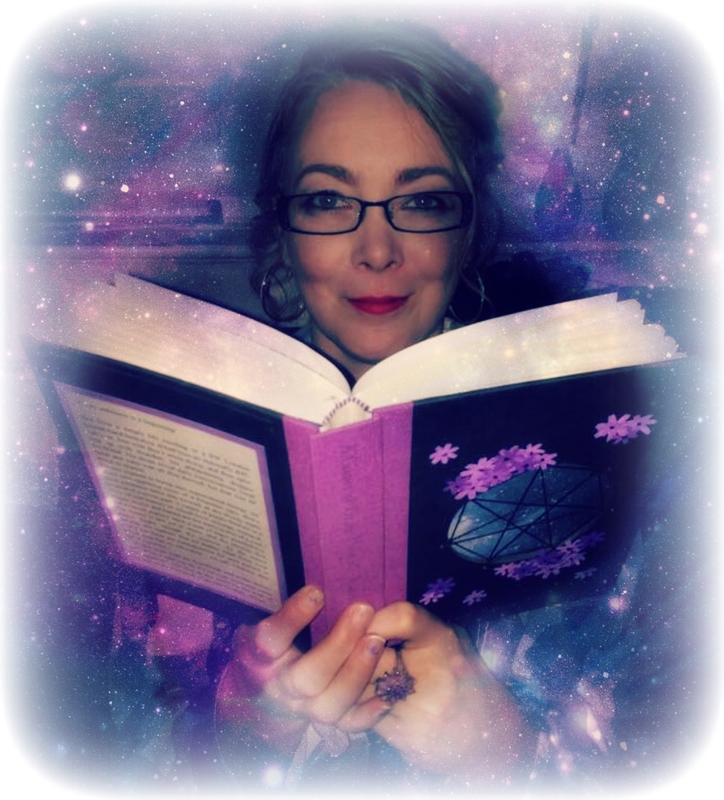 Actually, when I was trying to decide on what genre ‘A carpet of purple flowers’ would fit into, I noticed that it contained various elements – undertones of spiritualism, fantasy, paranormal and romance. I would really like to see ‘Spiritual Romance’ become a stronger genre in the future. I would love to create a little separate book of the Sindria elementals. How they came to be in more detail and to include the ‘The Heaven Stone’ teachings. While editing, I had to condense the book and really don’t want to lose those parts. Perhaps, I’ll write a book on the Deisi too, their original purpose, origins, etc. Another story, ‘The Butterfly Bridge’ was floating around inside my head for about two years prior to ‘A carpet of purple flowers’. Everything stemmed from the visual inspiration of a small, serene waterfall existing in a world far from prying eyes, hidden in a glade by dense woodland. Opposite the waterfall stood a large, ancient Oak tree which later became the focus of a special meeting. This visualization was initially a place for me to rest my busy mind before drifting off to sleep, but one night, a young woman appeared by the waterfall, her name Enna – and that was the starting place of all my later writing. I knew that ‘The Butterfly Bridge’ would take quite some time to write, as quite complex. So, I decided to start from a place that I knew well – SW London. This story very quickly grew into a bigger tale, and would need to be a trilogy – A Carpet of Purple Flowers. It was then that I decided that ‘The Butterfly Bridge’ was to be the fourth book, a pre-history, stand-alone addition. Is there a lot of research involved in your writing? Ha! Ha! Yes, there is. I never stop researching. ;o) My mind needs to be permanently fed information, not that it all stays in there. I research everything, then sift through what I feel is relevant to the story. There are few notebooks that I use to store factual, mythical information, and I usually refer back to that at a later date – cosmology, astrological, historical, pieces of lore etc. I find it all extremely fascinating – soul food. Do any of the characters in the book relate to your own life? A Carpet of Purple Flowers is your debut novel. How does it feel to be published? Absolutely amazing. Matthew at ‘Urbane Publications’ has created a wonderful concept, an author ‘family’. He truly delivers on ‘collaboration’. I’ve been able to discuss areas such as cover design, and most of the publication process, not many publication houses offer such unique involvement. The other authors have been fantastic too, and genuinely care about each other’s progress – it’s such a humbling experience. Overall, writing my first book has been a very positive journey. Yes, there’s been some very difficult moments when I have questioned myself/abilities, but something has pushed me on – the need to share the ‘Otherworld’ that lives in my heart. Thank you too Sonya, for asking me to be a guest on your blog. It’s been a pleasure. Matthew Smith is giving away 5 copies of ‘A Carpet of Purple Flowers’. To enter just leave a comment telling me what you think of the cover. The winners will be randomly chosen and notified within 7 days of the closing date. Their details will be given to Matthew Smith who will send out the prizes. From the first time I saw the cover I was drawn to it an ethereal yet earthy beauty of the here and now and the there.A wrapping just begging to be opened to reveal the contents inside waiting until it caught you up in its thrall……….leaving you perhaps the prisoner inside!!! A super thank you, Sonya. I feel extremely honoured to have been a part of your amazing Halloween Event. I’m still whizzing through your blog on my broom, parking up by every post. Truly amazing blogging ~ Big hugs ((( ❤ ))). I think the cover is very pretty and purple is one of my favourite colours. The cover is wonderful. Love the colors and the flowers against the black background. Nice interview too. Looks and sounds like a interesting book. Good luck on your book release. Matthew Smith is giving away 5 copies of ‘A Carpet of Purple Flowers’. To enter just leave a comment on the blog link below telling Sonya what you think of the cover. I love the cover. I’m not going to lie alot of the time I will buy books based on the cover and I would buy this one for sure. I love the colors and the details. This is an awesome cover! Very mysterious! It definitely tempts me to buy the book! To me it looks very whimsical and romantic. The only constructive feedback I would leave is that you cannot tell it involves the Fey (as a first time reader), but you can see it involves magical romance. Hi! 😊 Did you receive my email asking for your details? I have just sent it to you again.